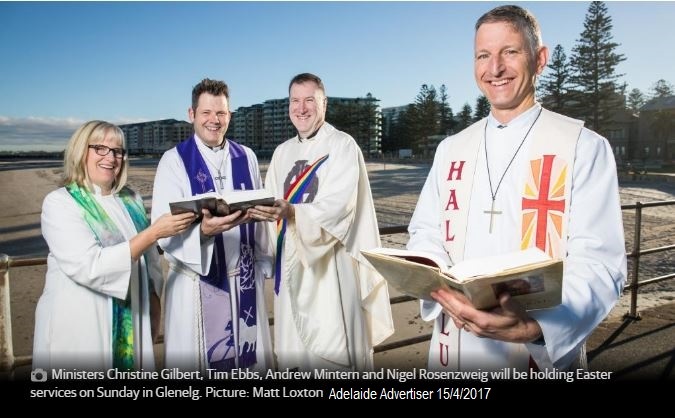 Did you see the picture of Fr Andrew in the Adelaide Advertiser? The Ministers of the Bay area were asked by the Advertiser to gather for a photo on the Glenelg Jetty earlier this week. Easter Sunday, the Ministers of the Bay Area will preside in an Ecumenical dawn service at 6.30am by the Glenelg Jetty. Unfortunately the article doesn’t mention the Ecumenical dawn service tho. We’re just glad we had a mention in the Advertiser!